in front at far left, who recently announced her retirement after 44 years on the show. Generations of children have watched Sesame Street, where they met everyone from puppets Big Bird and Oscar the Grouch to real life humans such as Mr. Hooper, Gordon, Luis, and Maria. Recently, Sonia Manzano who portrayed Maria, announced she was leaving Sesame Street after 44 years on the show. When I heard that, it got me thinking about my own experiences with the famed children’s show. It’s fitting to look back, given she joined the show not too long after I was born. I have always been puzzled at how so many children watched Sesame Street. When I was growing up, it was on CBC on peasant vision, at 11 a.m. every weekday morning. The only children who could watch it regularly were not yet old enough to go to school, or absent from school sick or playing hooky, and of course during summer holidays when children didn’t have school. The first time I ever remember seeing Sesame Street was when I was home sick from school. It followed two Canadian shows – The Friendly Giant and Mr. Dressup. Wikipedia just revealed it was intended for pre-school children. It all makes sense now. The show was broken into various segments, switching between live and animated. There were all kinds of ways the show tried to teach children various concepts, whether it was the alphabet or how to count. There are a few segments I remember well. There was the cartoon that followed a pinball through a machine, bouncing off bumpers and other things. “One two three four five six seven eight nine ten eleven twelve”. One summer, I saw that episode and maybe an hour later my cousin phoned. She asked me if I wanted to get together to do some drawing. We did get together every so often to do some art. The funny thing was, seeing that pinball segment had put me in the mood to draw. When my cousin came over, she said seeing that same segment put her in the mood to draw. There was the child sent to the store to get a loaf of bread, a container of milk, and a stick of butter. Everyone seems to remember that. There was also Canadian content. Obviously, what I remember most were the French segments. There was also one on the making of pyrogies. 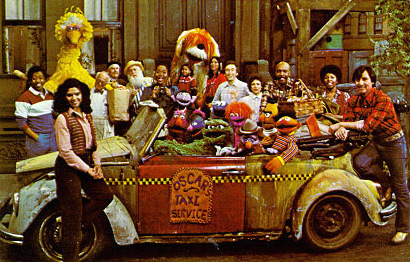 Sesame Street was populated with a wealth of puppet characters who interacted with real-live actors. There was Oscar the Grouch, who lived in a garbage can that seemed to be the tip of the iceberg, and the Count who, well, was a vampire who counted. There was Big Bird who was, well, a big bird. For a long time I thought Big Bird was a female when in fact he is male. He had a friend called Mr. Snuffleupagus, who only appeared to him when no one else was around. No one believed he existed, no matter how hard Big Bird tried to convince people. Eventually, his imaginary friend was revealed. My favourite was Kermit the Frog, who would go on to greater fame on "The Muppet Show". The puppets always caught my attention, much more than the adults. The adults were part of the street scene, which was live. I do not really have any memories of the “grownups” yet, in a lot of ways, they were the ones delivering the lessons. The one adult I do remember well was Bob McGrath, who played the character "Bob" on the show. I recall seeing him every year when CFCN Calgary, Channel 13, broadcast their Lions telethon, starting on a Saturday night, continuing all the way straight through to Sunday afternoon. I just thought it was so cool he was right here in my backyard, when Sesame Street seemed so far away. McGrath is still performing, at the age of 83, on Sesame Street. Sesame Street did not have the profound effect on me it may have had on some children. Maybe it was because I was barely five when I started school, or just that I found my stimulation in other ways, mostly at home. Still, it obviously had an effect because I do remember those various segments. More importantly, Sesame Street was one of those institutions that brought educational content to television, transforming it from that vast wasteland into a medium for learning. And all along the way, it least in my lifetime, was Maria. Enjoy your retirement, you have earned it. I’m sure generations of children thank you too.